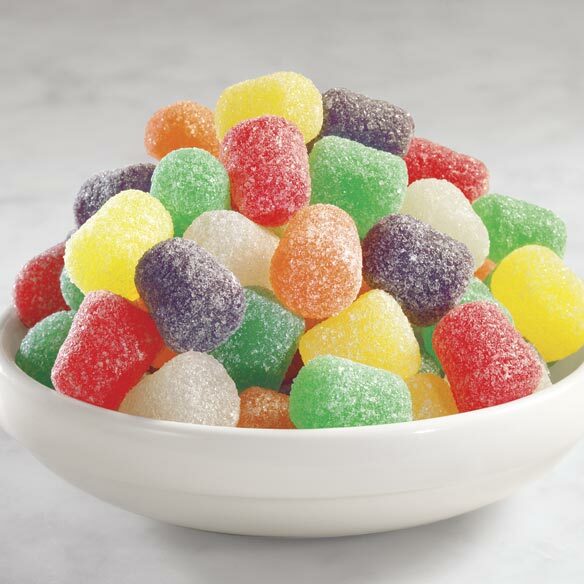 Spice Drops Candy - 24 oz. Spice drops candy is the nostalgic, candy-shop classics! Spice drops satisfy your craving for true spice flavor and old-fashioned, chewy goodness. The colorful gumdrops boast soft centers with spicy flavors of anise, cinnamon, clove, sassafras, peppermint and spearmint—each sprinkled with sugar for a sweet taste of yesterday! 24 oz. Corn Syrup, Modified Food Starch, Dextrose, Natural And Artificial Flavor, Red #40, Yellow #5 And Blue #1. Excellent candy. We had to hide the candy from our granddaughter. Great just like when I was a kid! Reminds me of the ones I had when I was growing up. GOOD SPICE TASTE. FRESH AND DELICIOUS. Was excited when these finally arrived. I love snacking on something sweet, but light and these hit the spot. The spice is just right. They are fresh, tasteful and enjoyable. Only one problem with these spicettes. I eat them too fast. They are addictive and I love them. Various flavors can be distinguished. I have bought these a few times. Great alternative to chocolate. Simple, old-fashioned treat. all candy I have received is excellant. I have never had a problem with any candy I have ordered the taste is good. Yum and good price too. Each color has a distinctive flavor. The red ones are a bit "hot" but not too much. The orange ones are my favorite but all are delicious. My hubby was looking for these for awhile. we couldn't find them very often in local stores. So, when we saw them here, we got some. they're really yummy. A bit smaller than the picture shows. But, still very tastey. we order these with each order we make from Walter Drake. I truly love these Spice Drops Candy, it reminds me of my childhood my Mama bought these and we kid's loved them I still do. I Will buy these again. This is about the fifth bag purchase since I found these. Always a welcomed treat in the house. I put them in a zip-lock bag and keep them by the tv...great snack. I can't put these down i love the spice drops. I love to snack on these. These are delicious this is my third time ordering. I set a dish out at the holidays and received inquires of where I purchased product. Candy bought at grocery store or large retail stores are not as fresh. I never buy from dollar stores. I have ordered these before. They are delicious! I would if they are on sale. Purchase this candy for my own enjoyment, they are vary good. The cost is a bit much. The candies are very tasty. I was extremely pleased that Miles Kimball sent a new bag to replace the original. It was broken and the candies were all over the box. The new box was in fine shape. Thank you Miles Kimball for the fast service. I would recommend them only to friends with strong teeth, no removable bridge work or braces. I have ordered several bags and all are very sticky. A friend likes them so well I buy them to keep her supplied. I like them too, but some of the flavors (black and orange) are too strong for my taste. I guess it was OK, the person I sent it to called to see if I was the sender. No name on package. I mentioned the fruit cake and that was delivered a week earlier with my name on it and they said it was terrible and threw it away. I emailed Miles Kimball and got a message that my email was forwarded to the proper person but never heard anything. Old and stale, very disappointed. These candies were stale, and hard to chew. Will not order again. I will keep buying this product because their candy is good. You can use them to decorate cakes and cookies. They are even good eating them by themself. I WAS LOOKING FORWARD TO THESE BECAUSE THE REVIEWS SAID THEY WERE FRESH AND SOFT. MINE WERE HARD AS LITTLE ROCKS. I SURE WOULD LOVE TO GET MY HANDS ON SOME SOFT FRESH ONES. I JUST LOVE THESE WHEN THEY ARE FRESH. They were hard, not chewy. Stale, and did not have any spice taste. I actually threw them away! The spice drops were stale and hard. Don't buy the space drop candy!!! The spice drops candy I received from you was TERRIBLE!!! We cannot eat it and don't expect anyone else to eat it. It tastes "funny" and has some kind of "after-taste" to each piece we tried. I am NOT going to spend money to send it back to you, so I'm out the money and will just trash the candy. I wished I hadn't ordered TWO packages of it! The candy is nothing like the spice drop candies I used to buy locally in previous years,, and I'm very disappointed in the product you sent. I would NOT recommend then to anyone. Spice candy is hard to find. So glad Easy Comforts carries it. I love these for myself!